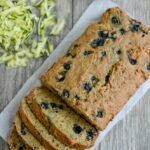 This Lemon Blueberry Zucchini Bread puts a fun twist on a classic summer recipe. Don’t like lemon? Skip the zest and add extra blueberries! Enjoy a slice for breakfast or an afternoon snack! In a large bowl, mix oil, eggs, sugar, vanilla and zucchini. Add remaining ingredients, except blueberries, and stir until just mixed. Gently mix in blueberries until combined. Bake at 350 degrees F for 50-55 minutes. The original recipe was: 1/4 cup plain Greek yogurt, 1/4 cup applesauce, 1 egg, 1 egg white, 1 cup zucchini, 1 tsp vanilla, zest of one lemon, 1.5 cup white whole wheat flour, 1/4 cup AP flour, 1/3 cup sugar, 1.5 tsp baking powder, 1/2 tsp baking soda, pinch of salt, 3/4 c blueberries.